In short vignettes titled as if they are pieces of fine art, the bleakness of this new reality is expertly rendered...Resplendent with Anderson's trademark dry, sarcastic wit, this brief, complicated read serves as a scathing social commentary and, as the title indicates, an interrogation of free market economics. Some fear that hyper-capitalist technocrats, under the guise of altruism and progress, are fleecing the world; Anderson (Feed, 2002) stretches this premise to deliriously enjoyable extremes...Throw in a romantic rival, an interplanetary art contest, and plenty of scintillating details about the Lovecraftian horrors of the vuvv, and you’ve got the makings of an elegant, biting, and hilarious social satire that will appeal to dissatisfied, worried readers of all ages. Anderson takes issues of colonialism, ethnocentrism, inequality, and poverty and explodes them on a global, even galactic, scale. A remarkable exploration of economic and power structures in which virtually all of humanity winds up the losers. This sharp, compelling, slim volume packs a punch. Anderson’s vivid world could be a mirror for many American communities today...Despite the heavy subject material and pervading sense of doom, the book ends on a hopeful note, making this a solid choice for a variety of readers. An engrossing, speculative look at life in the margins, this is a first purchase for libraries serving teens. Parable, satire, dystopic sci-fi—Anderson’s take on a near future in which alien “vuvv” have colonized America’s economy, land, and airspace has so many shiveringly close resemblances to the contemporary world that it might also be termed “realism.”...Anderson’s prose is almost hyper-lucid here—appropriately so, as the story is structured around Adam’s descriptions of his paintings. Practically every word reflects a prescient, bitingly precise critique of contemporary human folly, of economic and environmental inequities and absurdities. M.T. Anderson (Feed; Symphony for the City of the Dead) has written a biting satire about the world's haves and have-nots, set in an increasingly stratified near-future where the human race has, for the most part, become expendable. It's a strange and wonderful fantasy about seeking love amid the filth, and keeping hope alive, despite unquestionable odds against it. Anderson's down-and-out in the post-scarcity world is a scorching, arch, hilarious and ultimately very moving little parable about the cult of markets and the elevation of corporatism over human kindness. It's as zeitgeisty as Feed ever was, and such a compact little gem of a book that you very well might read it in one sitting, as I did. Ultimately, though, I don’t read J.K. Rowling — or M.T. Anderson, or Ursula K. Leguin — because of what their books have to tell me about life. I read them because these writers have mastered the ancient magic of storytelling, and because they remind me of what it’s like to be young, living in a world that seems both simple and incomprehensible. In the near sci-fi future envisioned by M.T. 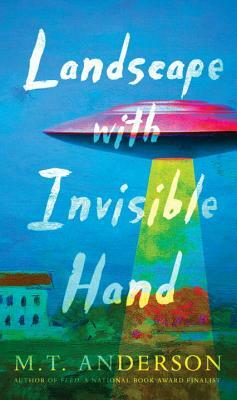 Anderson in his slim and coruscating young-adult novel ‘Landscape With Invisible Hand,’ human adolescents flirt and banter for the pay-per-view pleasure of earth’s new overlords, a squat species of alien known as the vuvv…In this bitter, witty story for readers ages 14 and older, Adam’s only hope seems to lie in winning a lucrative trans-galactic art prize—until he hits on an even more radical solution. Anderson’s vision of alien invaders is captivating. In this novella, National Book Award winner M.T. Anderson writes a multilayered and scathing satire...It's a bleak but necessary lesson in trying to find the beauty in the disastrous, all while learning to recognize when it's time to dream a new dream. A fantastic new satire from M.T. Anderson...equal parts humor and philosophical rumination. Fans of Feed will be intrigued to follow the development of Anderson’s dystopic imagination into this similarly themed futuristic critique of the present. A slim, stark, brilliant cultural commentary...a satirical portrait of the artist as a young man and a resonant portrait of contemporary society. Short, pointed commentary on art, politics and aliens! Funny and tense. Reminiscent of Kurt Vonnegut on a satirical roll.